With its rugged reliability and exceptional all-around performance, the 8365W-267 1/2 HP AC Chain Drive Wi-Fi® Garage Door Opener is the perfect choice if you want enhanced style, reliability, and the performance attributes of our best-selling drive system ever. Technology, and the Timer-to-Close system. Works with MyQ which provides included core features, including controlling your garage door from anywhere and subscription-based partner integrations. Liftmaster has taken your home security and safety a step further. 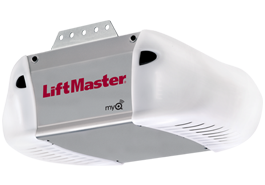 To reduce the risk of injury to persons – When the LiftMaster Internet Gateway is used with garage door openers, the operator must be installed with sectional doors.